A mid-fall beach-faring warning to you all: Just because you’re hovering godlike above the chilly water in your elegant swan raft doesn’t mean you can wing it! Stay aware of your surroundings. Maybe just take a long, luxurious bath instead. The incident occurred on October 21 when Florida mom Tara Myers and her 7-year-old son, Brennan, went to Anna Maria Island in Manatee County for some harmless water frolicking. So they thought. 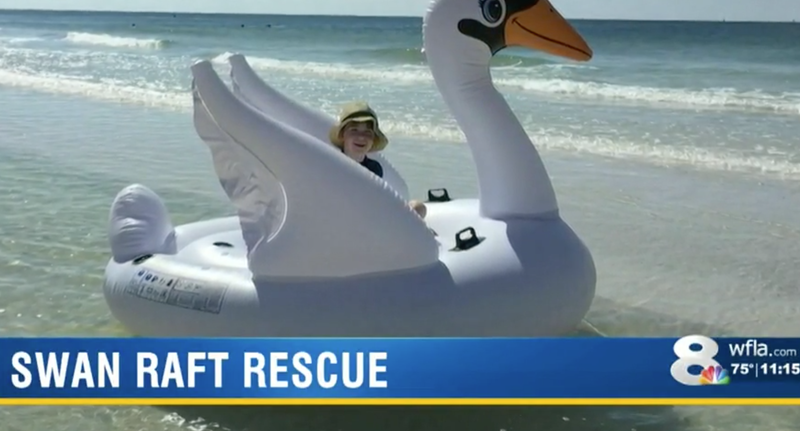 NBC affiliate WFLA reported on Monday that Myers, noticing the sea was calm and the winds were mild (but winds do change) took Brennan out on the huge swan raft they’d brought along to the beach. Myers said that the current quickly carried them many miles offshore. “I was not sure if we were going to keep drifting because land just kept getting farther and farther and farther away,” said Myers.